Familial Mediterranean fever (FMF) is a hereditary autoinflammatory disease characterized by recurrent, sporadic, self-limited episodes of fever accompanied by peritonitis, pleuritis, arthritis, and/or erysipelas-like erythema. The disease is prevalent among populations surrounding the Mediterranean Sea, however, in recent years, more cases have been reported in countries not related or close to this region. The frequency of episodes varies from once every week to several times a year, and unlike the term “periodic disease”, the attacks are at random and not cyclic. A typical attack of FMF lasts 0.5–3 days, and between attacks patients are mostly asymptomatic. One of the devastating outcomes of FMF is the development of AA amyloidosis, which mostly affects the kidneys but may involve other organs. Since 1972, life-long prophylactic colchicine has been the treatment of choice for FMF, which reduces the number of acute attacks and prevents the development of amyloidosis. Several sets of diagnostic criteria and several severity scores have been proposed. The disease is caused by gain-of-function mutations in the MEFV gene, encoding pyrin, a protein which by binding to additional proteins form the pyrin inflammasome. 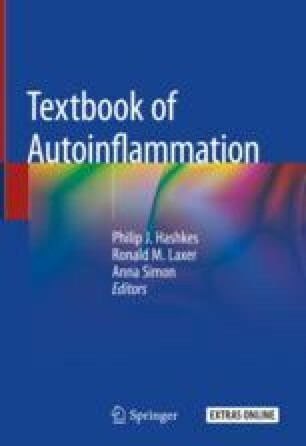 Mutated pyrin is associated with activation of caspase-1 and the release of interleukin (IL)-1ß, resulting in inflammation. Unraveling the molecular mechanisms of FMF led to the understanding of the potential of IL1ß blockade as a novel treatment in patients with colchicine-resistant FMF. However, colchicine remains the main treatment of FMF.